Adopt a shelter cat this month! Just think, your next lovable, huggable, furry feline friend could be waiting for you at your local animal shelter right now! June is Adopt-A-Shelter-Cat month, and it’s no coincidence that this special month falls right at the height of kitten season (when kittens are being born in large numbers.) Each spring, shelters across the country are inundated with thousands of newborn kittens that join the millions of cats already in the shelters. This means that your local shelter has lots of cute, cuddly kittens in addition to adult cats of all shapes, sizes, ages, energy levels and temperaments. There’s never been a better time to add a feline to your family than right now! Shelter cats can be a “purrfect” addition to your family for several reasons. Many shelters will be promoting adoption through a variety of special adoption deals such as free older cats and reduced adoption fees for younger cats and kittens. Shelter cats are often already spayed or neutered, dewormed, vaccinated, treated for fleas or ear mites, microchipped and checked for feline leukemia. However, if they’re not, you can easily find a pet insurance company, like Pets Best Insurance, that offers a wellness package to help pay for some of these items. Pets Best Insurance also offers a very affordable Feline Illness only pet insurance plan, which may help you save on veterinary bills. It’s important to consider your lifestyle, needs and expectations when choosing your new shelter cat. If you are thinking of adopting a kitten or young cat, do you have the time and patience to work with the cat through its adolescence? You will need to take playing, training and energy level into account. Many people are unaware or forget how mischievous and rambunctious a kitten can be. They can be a lot of fun, but they definitely require more attention and work! You need to factor in plenty of time for socialization and supervision to ensure that the end result will be a well-adjusted adult cat. Kittens can also be quite destructive, and it will be important to kitten-proof your home and be prepared beforehand for your new arrival. If yours is a full-time working household, it may be a good idea to pass up kittens and adolescents (less than 18 months old) in favor of a more low-key adult whose energy needs will be easier to meet. It is typically easier to find homes for the cute little kittens, so I encourage people to think about adopting an older cat. They are the animals in most need of forever homes. Adult cats can make wonderful companions because their personalities are already developed, so for the most part you know who and what you’re getting. I added an 8-year-old shelter cat to my fur family last year, and she is a delight! Her foster mom was able to tell me all about her personality, likes and dislikes, so I got the friendly, outgoing cat I was looking for. If you’re considering becoming a first-time cat owner, or if you want to add another cat (or two) to the mix, now is the time to do it. Head over to your local animal shelter where you’re sure to find the “purrfect” feline friend who will add lots of love and laughter to your life. Best of all, by adopting a shelter cat, you’ll be saving a cat’s life. That’s what matters the most. 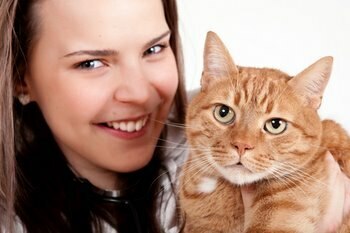 For more information about cat health or to learn more about pet health insurance, visit Pets Best Insurance today!